Grilled cheese Sandwiches in the Hot Pot? 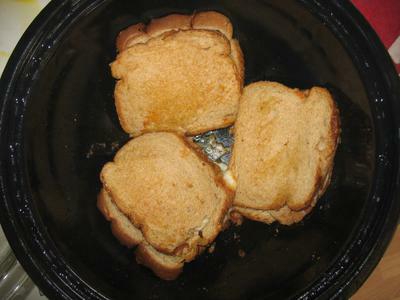 We didn’t have access to a stove or griddle for lunch, so we decided to try grilled cheese in the Solar Hot Pot. Unusual, but why not? It turned out amazingly crunchy and buttery, with delightfully melted cheese and sweet tomato slices. Buttered the outside of the sandwich; left the first side in the Solar Hot Pot 60 minutes; left the second side 30 minutes. Yum! Did diced, seasoned potatoes in the 2nd Hot Pot (forgot a picture again! Sad smile) They didn’t get browned or crispy (probably partly because we did quite a big pile), but they were very tasty.